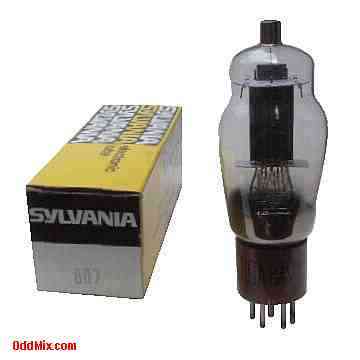 This is an original, sturdy 807 Beam Power Triode AF RF Amplifier, Oscillator, Modulator Sylvania electron tube. It has a five contact socket with an anode pin connection. This is a popular tube for radio amateurs and it's also a vacuum tube. The 807 is heather-cathode type used as af power amplifier and modulator and rf power amplifier oscillator tube in transmitters. May be used with full input up to 60 MHz and reduced input up to 125 MHz. Useful for amature radio and ham special projects or to set up a private vacuum tube museum. It is unused, tested condition. First come first serve only one available!